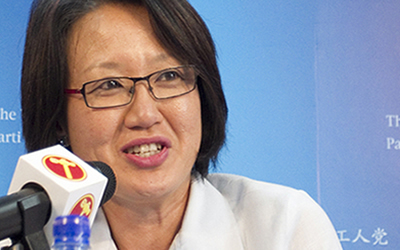 WP’s Sylvia Lim to re-enter legal practice? Worker's Party (WP) chairman Sylvia Lim is reportedly taking steps to practise law again in Singapore. The new Member of Parliament for Alunied GRC sought the required approval from the Law Society to file for a practising certificate through the Supreme Court's e-filing system, reported The Straits Times. Nearly two months ago, she resigned from her post as a law lecturer at Temasek Polytechnic, which she had joined in 1998. Before her more than 12 years as a lecturer, she had practised law when she had been a legal assistant for four years at a local law firm. Explaining her resignation from the polytechnic at that time, she said that it was due to the expected heavier workload as an MP. Lim pointed out that even when she was a Non-Constituency MP (NCMP), she had found her parliamentary work taking up her working hours. However, her move to re-enter the legal circuit is in line with her statement then that she had no plans to be a full-time MP, and would instead explore career options that would give her more flexible hours. Lim is likely to join Peter Low law firm helmed by former Law Society president Peter Low, if she does get the practicing certificate, the paper said. Last week, Lim's fellow WP member and MP for Aljunied GRC Chen Show Mao announced his decision to step down as a partner in the Davis Polk & Wardwell law firm with effect from this month. In a statement published on his Facebook page, Chen said that the new responsibilities as an MP will not allow him to continue practising law the way he had for the last 20 years. He also said that his retirement will provide him with more time for family, constituency and country, adding that he will also explore alternative work arrangements.